Enjoy heightened accessibility with this classic design. uPVC French doors are adept at letting natural light pour into your home creating a more spacious and airy atmosphere. They are an aesthetically pleasing option, created with security in mind as well as elegance. Our uPVC French doors are lead free and are Secured by Design accredited to give you peace of mind about the level of protection they provide your home with. They are fully compliant with the latest Building Regulations criteria, so that you can buy from us with confidence. Our doors are available in a variety of styles for you to choose from. Select from chamfered or sculptured profile, 28mm double or 36mm triple glazing, standard 4-chamber or EnergyPlus 6-chamber profile – along with the choice of three threshold options, hardware, finishes and glazing options. We also provide a large colour selection for our uPVC French doors that include White, Rosewood, Cream, Irish Oak and Light Oak. We can provide them in bespoke colours also including Chartwell Green, Grey and classic Black. We’re confident that we can tailor your uPVC French doors to look exactly as you envisioned. Our uPVC French doors have ultra-slim sightlines that can give a spacious and clean appearance. With less frame and more glass, our uPVC French doors let in an increased amount of natural light to make your home feel lighter and airy. Our uPVC French doors can be customised with your choice of colour as well as the options of sidelights, handles, hinges and low thresholds. This results in doors that are unique to your personal style that match your property perfectly. With a unique six-chamber uPVC profile, our French doors contain and conserve heat keeping your home warm and cosy. This in turn will reduce your energy costs and decrease your carbon footprint. A win-win situation when it comes to money and the environment. Glazed doors will open up your home, transforming its look and blurring the boundary between inside and out. A French door usually comprises of two doors on opposing sides of the frame that lock together in the middle. Therefore, uPVC French doors are an excellent solution for properties that have smaller spaces available unlike bi-fold doors that require a decent amount of space to open out. Choosing the right type of door for your home can feel daunting with the amount of choices available, but we pride ourselves on our exceptional customer service where we can not only recommend and advise on what solution is best for your home improvement project, but we can provide competitive prices to suit your budget. 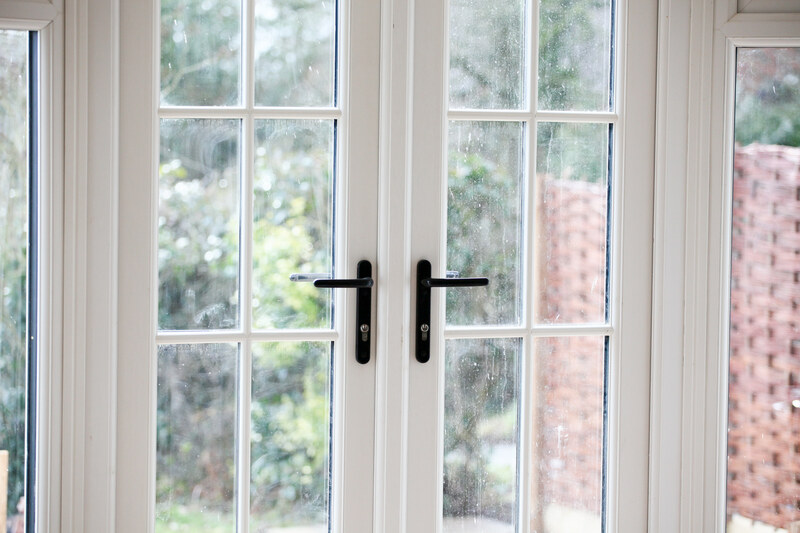 If you own a period property, uPVC French doors can seamlessly integrate with the style of your home, with a range of finishes and grains to give it that high end touch. uPVC French doors are perennially popular because of their classic and simple look as well as their easy to use functionality. They aren’t limited to traditional or period properties though, they can add character and grandeur to a contemporary property also. We can provide eye-catching French door designs that perfectly complement your home in Epsom, Banstead, Leatherhead and Sutton. The aesthetics of your home are just as important as the functionality, durability and security so we know that our refined French door designs will impress. Our uPVC French doors have many excellent benefits other than just providing class and elegance to your home. You can also enjoy the reduced heating costs it rewards you with, secure and quality locking and extreme durability when it comes to the UK’s adverse weather conditions. Our uPVC French doors can achieve effective heat conservation allowing you to enjoy a warmer home and reduced bills. They also prevent noise pollution from filtering into your home providing a calm and quiet environment. You can select your uPVC French doors to either open inwardly or outwardly depending on what best suits your living space. French doors are an attractive alternative to patio or bi-folding doors with a large range of styles to choose from. You can use uPVC French doors pretty much anywhere in your property. Install them in your porch, conservatory or as direct access to your garden, wherever you place them they will provide a high performance function and enhance your property aesthetics. Design your own French doors with our quote engine and receive your tailored quote in moments. This innovative design tool allows you to customise your French doors to your liking and see how much you could be saving with our competitive French door prices. We would be more than happy to discuss your needs and requirements when it comes to your home improvement project. You can fill out our online contact form and we’ll endeavour to get back in touch with you as soon as possible. We know that adding uPVC French doors to your property is a worthy investment and we’d be happy to talk you through the range of options and your budget in order to get the best possible price for you.